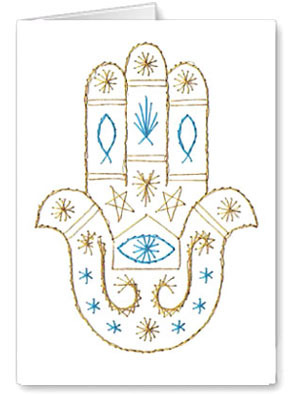 The Hamsa hand is a symbol of good luck and protection. The card has been stitched in attractive, impressive colours of gold and blue. Each stitching card pattern comes with step-by-step instructions and diagrams. Just download the e-pattern, prick the stitch card pattern onto card and stitch with cotton or embroidery thread.